In the bowl of an electric stand mixer fitted with paddle attachment, combine 3 cups flour, 1/3 cup sugar, baking powder, and salt. Mix on low speed until just combined. In a separate bowl, whisk 3 lightly beaten eggs, vanilla, lime zest, and ¾ cup coconut milk, until well blended. Then place egg mixture in refrigerator to keep cold. Shred frozen vegan buttery sticks (or butter, as preferred) into bowl of mixer (or into a separate bowl, then add to dry ingredients in mixer). Mix on low speed for a few seconds, until just incorporated, resembling small peas. In a separate, small bowl, combine dried cherries with remaining 1 teaspoon flour and mix to lightly coat fruit (this will keep dried fruit from clumping together). Set aside. Add cold egg mixture (from refrigerator) to dry ingredients in stand mixer. Mix on low speed until dough just begins to come together. Stop and add nuts and dried cherries. Continue to mix on low speed for a few seconds, until final two ingredients are just incorporated into dough. Do not over mix! Transfer dough to a lightly floured work surface. Using your hands, shape dough into an approximate 8-inch round disk, 1 ½ inches high, with as little handling as possible. Using a flat metal scraper or pastry cutter, cut disk into 8 wedges (making straight, firm cuts with little sawing motion; you want to avoid overworking or stretching dough). Transfer wedges to a parchment-lined baking sheet. In a separate, small bowl, whisk remaining egg with remaining 3 tablespoons light coconut milk. Using a pasty brush, lightly brush tops and sides of each wedge, then sprinkle each with a bit of the remaining 1 teaspoon sugar (use a 1/8 measuring spoon for ease in dusting each wedge with sugar). Bake for 20 to 25 minutes, until lightly golden brown. 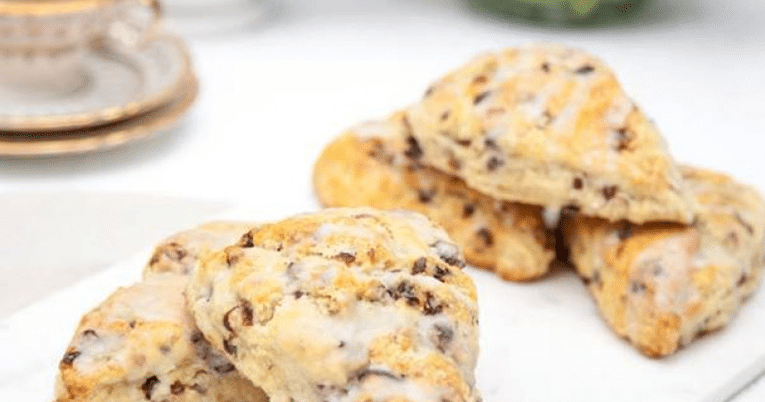 Allow scones to cool for 15 to 20 minutes before glazing. To glaze, place scones on a cooling rack positioned over baking sheet still lined with parchment. (This reuse of baking sheet will make clean-up easy). In a small bowl, whisk powdered sugar, coconut milk and lime juice, until smooth. Add lime zest and mix until fully incorporated. Using a spoon, drizzle each scone with a bit of glaze. Allow glaze to set for approximately 5 to 10 minutes. Transfer scones to platter and serve immediately.